Stress stress stress, it is everywhere. Dead lines, work pressure and stress of finding work, managing work , promotions , family , relation ships. There is a long list of stress triggers. And our mind and heart have to deal with everything happening in outside world. We all know that stress is the cause of most of chronic diseases. It squeezes out the happiness from our lives. There are many things you can do to relieve stress. It is difficult to totally eliminate the stress but it is really possible to manage the stress before it becomes chronic. ( If you feel that stress is taking a toll on your health and relationships , it is important to go Medical Practitioner). Meditation helps in soothing our minds. It has therapeutic effect on our body and mind. Most of us know the real positive effect of meditation on our health but don’t incorporate it into our daily schedules. It is important to squeeze some time from our busy schedules for meditation to calm your mind. Stress will ultimately lowers, when your mind wanders less. Whenever you feel that you are getting stressed and overwhelm have replaced excitement, just stop , start deep breathing and try to breathe mindfully. It will help you in lowering down stress. All that extra oxygen will help in more blood circulation and relaxed mind and body. Exercise helps in releasing good hormones in your body. It helps in releasing feel good neurotransmitters which helps in stabilising your stress. Exercise and all the physical activity helps in releasing endorphins which are considered having similar effect as painkillers. Physical activity reduces the amount of stress hormones namely adrenaline and cortisol in the body. Exercise and sports helps in keeping you busy in recreation activities and giving you less time for worry and negative thoughts. Mind and soul always feel relaxed when there is no worry and negativity. Sometimes as humans we try to please everybody. But in doing so, it becomes hard to concentrate on every task and project. Unfinished tasks always give a kind of overwhelm and stress. If somebody ask you to do their task , it is better to say NO rather than not completing that task and feeling guilty about it. Other person may have some deadline to finish but you didn’t completed that. This can take heavy toll on your relationships which can further cause worry and stress. Never try to please everybody. And you cannot please everybody. Better, learn to say NO and save your self from extra stress. Most of the time, multitasking trigger stress because you try to accomplish each and every task altogether. Multitasking requires your brain to adjust to new task everytime you juggle tasks. In doing so you waste time and your brain takes time to adjust to new task every time. After sometime, you start feeling stressed because you have accomplished nothing. 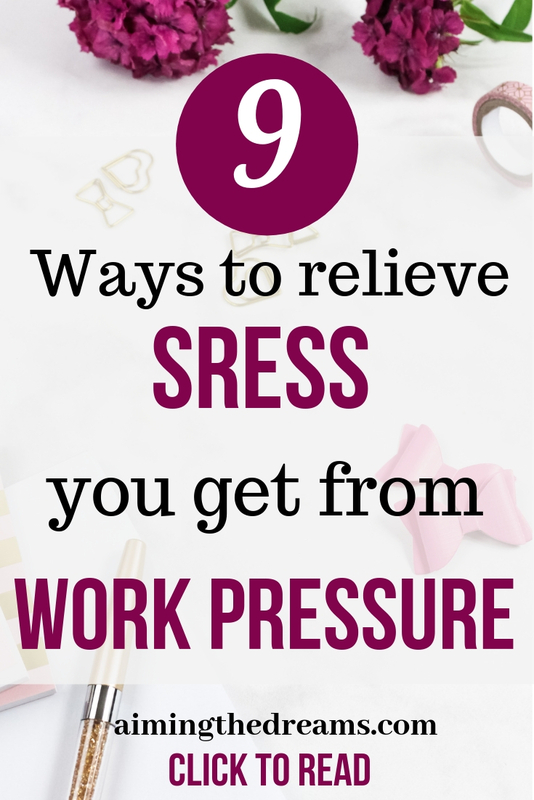 To avoid this kind of stress, start with one task, complete that and then move to next task. Procrastination is putting your tasks off for another time. When you don’t complete your tasks, they always surface your mind now and then. Unaccomplished tasks always create stressful situation. It is in your best interest to resolve small tasks immediately and don’t let them pile up in the realm of your mind. Some of the supplements have very good effect on stress management. If stress is becoming chronic, start getting some supplements (Please contact your health care provide before starting any supplements). Magnesium, Melatonin ( sleep hormone released by body ), Vitamin B complex ( required for cell metabolism). Vitamin B12 is a key for having better brain function. I recently got diagnosed with severe Vitamin B12 deficiency. Though I had nothing to stress, I felt stressed and started forgetting everything. I was given 6 Vitamin B12 injections to load my body with B12. I am feeling much better now. My body has stopped metabolising Vitamin B12. Supplementing it with Vitamin B12 has helped me a lot. Omega 3 fatty acids, Coenzyme Q 10, Ashwagnadha are really considered good for relieving stress from work pressure. A well balanced diet is the key to happy and stress free body and mind. Healthy and wholesome foods are known for their good effect on stress management. Complex carbs are considered good in releasing serotonin in brain. Citrus fruits full of Vit C are helpful in increasing immunity as well as taming stress. Vitamin C helps in coping with stress. Nuts and seeds also a great source for reducing stress. Eating few nuts daily may help in reducing the inflammation in your arteries and Cholesterol. Another super food considered very good is avocado. It is rich in potassium which helps in lowering blood pressure. Natural surroundings always help you in managing your stress. Always sitting inside in covered areas make you prone to stress. When you go out in nature, it helps you in reducing your blood pressure( if you have), reduces stress hormones and helps in releasing feel good hormones. This is the reason, nowadays plants and herbs are planted even inside the offices. They helps in giving better environment which is good for working as well as human body. Please share if you like this post. I will be really thankful to you for this. 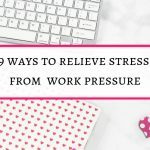 Great tips for relieving stress from work…..thanks for sharing them….for me, music is the best stress reliever, as I listen to music almost all the times. Hi Anindya, music is really therapeutic and helps in reducing the impact of stressful life.I love to listening Sufi music and ghazals. But sometimes, fast beat Punjabi music cheers up me haha. Thanks for reading and commenting. I agree that exercise helps relieve stress. This has been my go to “therapy” for years. 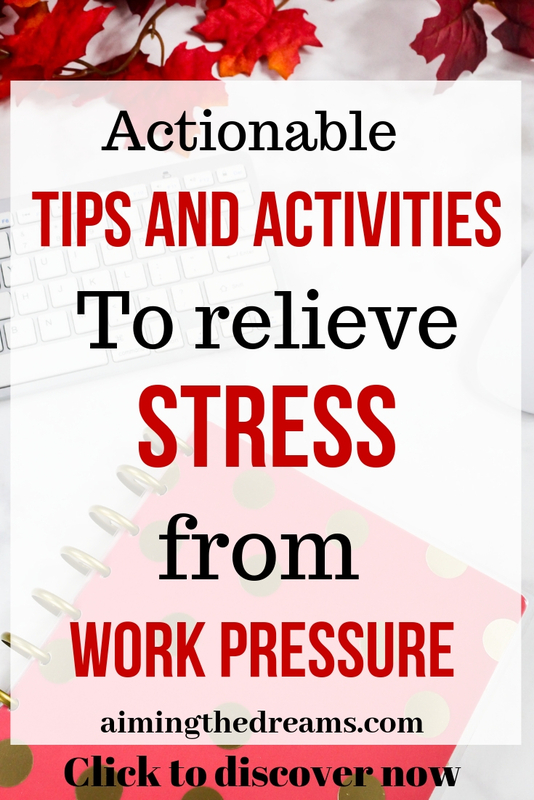 You have some other fantastic ideas for stress reduction with work. We all need it. Thank you Jenny for stopping by and reading. Stress IS everywhere! Thanks for these tips on how to lessen potentially negative impacts. Hey Shirley, thanks for reading. Really good tips. I love meditation and learning to say no has saved my sanity many a time. Thanks Priya for your comment, meditation helps a lot in relieving stress. Great tips! I find that when I’m getting stressed that I’m usually trying to juggle several items at once. It helps on my stress-level to readjust and focus on just one thing. Hi Nicole, Multitasking makes you overwhelmed but in today’s world, we love to multitask which is a reason for stress. Thanks for stopping by and reading. I am a full time working mom (and now a blogger too). I am under so much stress! Thanks for sharing these great tips! Hey Renee, how do you manage all this? I stay at home and just work on blog and it feels so tough. Tanks for commenting. Work pressures are the worst! And then coming home to a busy family after work, its tough! Hey Elizabeth, yes it is really tough situation. I agree. 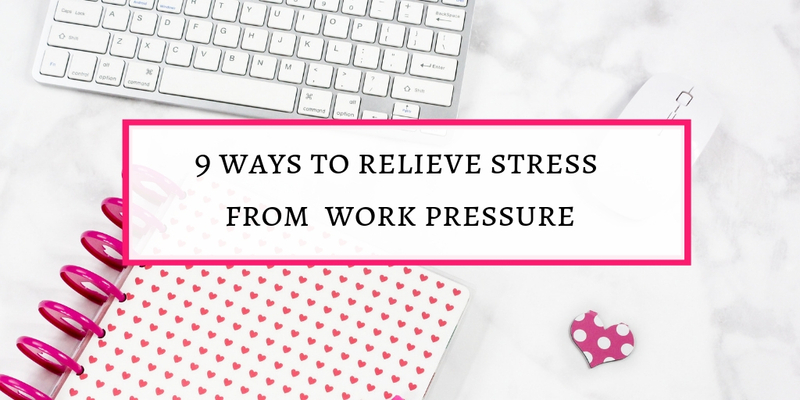 These are certainly a few stress relievers. Particularly exercising goes a long way into beating the stress. Thanks for sharing. Thanks Vimal for beautiful words. You articles always provide paramount tips for self improvement. 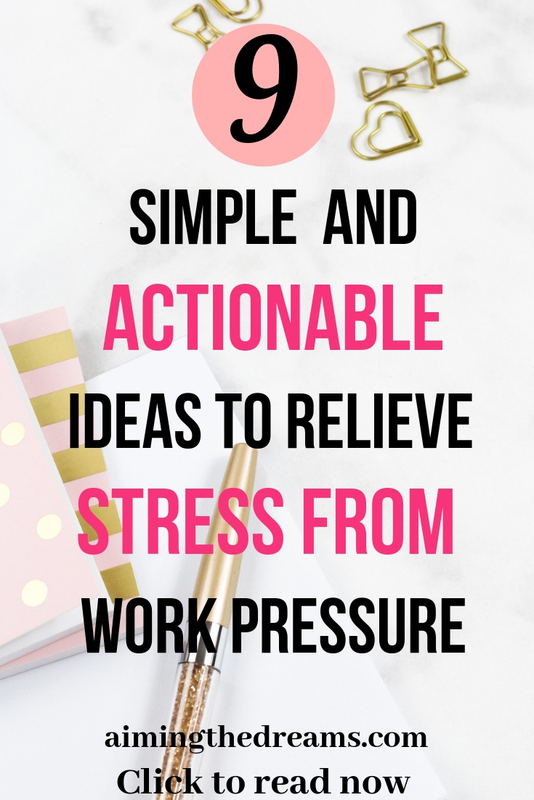 This post contains simple ways to relieve stress that I found very helpful to me. Thanks for sharing. Thanks John for your beautiful words. Exercise and meditation really help release stress, it works for me! Exercise and meditation are great for relieving stress. Great tips. I had a lot of luck using omega-3 supplements for work and other benefits too. They helped me with a lot of brain fog I was having. Since taking them, I have more energy and can think more clearly! Hi Frank, Omega 3 supplements really makes a difference in controlling the effects of stress. Thanks for stopping by and reading.